Peter Engel, one of the most prolific producers in television with more than 1,000 episodes produced under his banner, single handedly created the teen sitcom with Saved By The Bell, which he executive produced through all of its many incarnations, and which led to his many other teen series, including California Dreams, Hang Time, City Guys, and USA High. As if defining and conquering the teen arena wasn’t enough, Peter produced the iconic Last Comic Standing, enabling the discovery of an entirely new, fresh generation of comedians. All of this would be more of a career than any producer could ever dream of having, and with more than 50 years in the television industry, Peter has forgotten more than most will ever know. But Peter’s story isn’t just his professional success; his life and work touched and inspired an entire “Bell” generation, whose values and views of a diverse world were shaped by the stories and plain old fun of Peter’s shows. There is also another side of Peter that most don’t know—his personal journey that began in New York City’s Upper West Side; his discovery of television the night his family’s brand new TV lit up the living room; his first taste of creative success; the injustices of the 1950s; working for JFK’s election in 1960, with the catastrophic letdown that followed; his dream in the 1970s of making “important” television; his loves, marriages, family, and faith; and, in the 1990s and 2000s, finding his greatest success where he least expected it. Along the way, Peter encountered some of the most iconic personalities of his times—John Lennon, Orson Welles, Bette Davis, Jacques Cousteau, John DeLorean, and, of course, John F. Kennedy, among them—and great stories always followed. 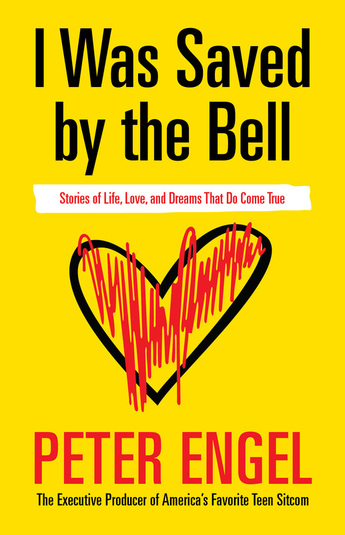 I Was Saved by the Bell is the chronicle of Peter’s amazing journey. His stories will make you laugh, cry, and want them never to end. Together, they are a master class on life from the perspective of a man who grew up during a time of great uncertainty and came of age in an era of hope and promise. With the ups and downs of the decades as a backdrop, Peter opens his heart and shares the experiences of his own good times, bad times, reflection, redemption, and, ultimately, joy and satisfaction of a life lived the only way he could—with passion. Visit www.iwassavedbythebell.com for more information. This entry was posted in Award, celebrity, honoree, Recognition and tagged actors, actresses, art, author, dreams, life, love, NBC Network, opportunity, passion, Peter Engel, purpose, Recognition, relationship, Saved By The Bell, Science, story lines, Television Producer, Today's Honoree. Bookmark the permalink. Comgratulations and welcome to the club.